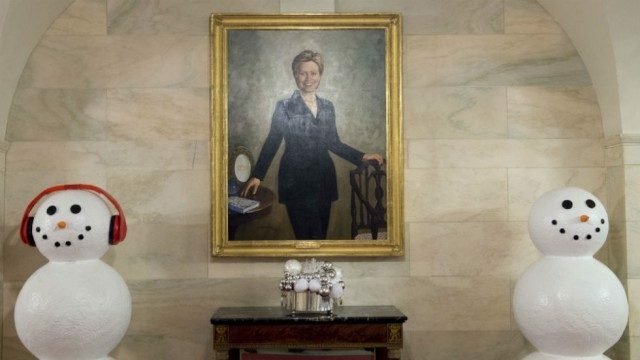 While Hillary Clinton's portrait was surrounded by Christmas decorations in 2016, this painting has been at the White House (and decorated each year) since 2004. President Obama hung a portrait of Hillary Clinton at the White House as part of his 2016 Christmas decorations. A photograph showing Hillary Clinton's portrait surrounded by snowmen is real. This portrait was not hung by President Obama in 2016 as part of the holiday decorations; it has been at the White House since 2004. She didn’t win the election, but Hillary Clinton still has a place at the White House — between two snowmen. 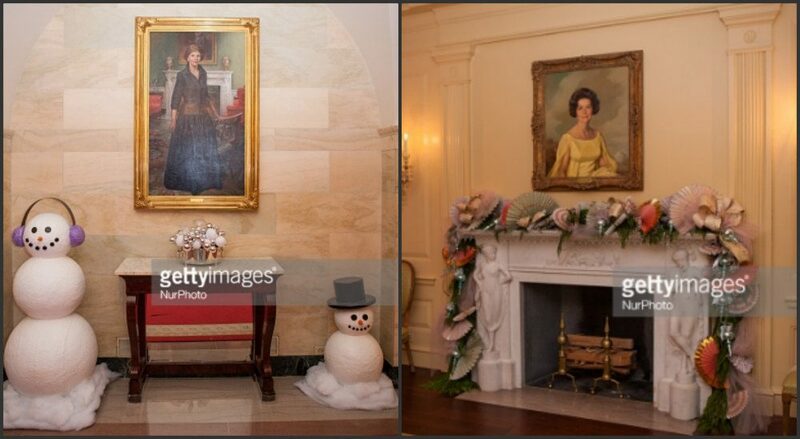 An official portrait of the former first lady and Democratic presidential nominee is hanging in the Cross Hall of the White House, displayed alongside an array of bells, baubles and other holiday décor. If I wasn’t already exhausted from all the Hillary drama, this would be the nail in the coffin. The Obama’s have decorated the White House, and it seems they can’t even do that without being annoying. They have basically just flipped Trump off, once more by hanging a portrait of Hillary Clinton prominently among numerous amounts of Christmas decorations right smack dab centered above the fireplace in the Cross Hall. Newsflash, Mr. and Mrs. Obama… Hillary Clinton didn’t win, nor did Trump steal the election from her. Americans gave it to him. America has spoken and the longer the Obama’s keep acting like fools over it, the more they are hurting their own party. It would have been far more appropriate to hang a portrait of the Trumps as the soon to be presidential family. President Bush praised his predecessor’s “energy and joy” Monday as the official portraits of former President Clinton and first lady Hillary Rodham Clinton were unveiled in a lighthearted ceremony at the White House. The Clintons received a standing ovation from guests in the East Room of the executive mansion before the paintings by artist Simmie Knox were revealed. To sum up: Twelve years after a portrait of Hillary Clinton was first put on a White House wall, two snowmen were placed near it as part of this year’s holiday decorations. The Hill. 29 November 2016.